High energy costs – A big part of your siding’s job is to keep your home energy-efficient by keeping indoor heat in and outdoor heat out. If you see a noticeable increase in your electric bill, this means your siding might no longer be as insulative as before, making your HVAC system work harder than it normally would to maintain indoor temperature in the home. Rotting or warped panels – Moisture damage can severely weaken siding panels, especially those made out of vinyl or wood. Severe cases of rot or warping usually leaves no other option but replacement to get siding back into shape. Missing panels – Even the smallest gaps in your siding can lead to moisture damage. Just missing a few siding panels could greatly compromise your home by letting a lot of water seep through so an immediate replacement will be necessary. Additionally, missing panels can promote air leakage, reducing your home’s energy efficiency. Mold or mildew formation – Like plant growth on the roof surface, mold and mildew on your siding panels is a sure indication that moisture is always present on your siding. While mold or mildew growth may appear like a cosmetic problem, it does point to the fact that your siding is always steeped in moisture. Even when you don’t see damage on the surface, it’s possible that rot is lurking underneath, eating away at your siding from the inside. 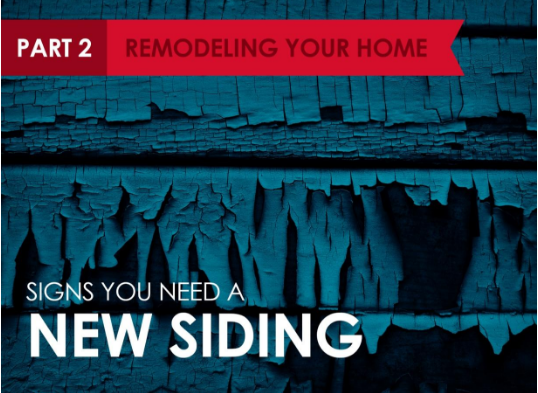 When looking for replacement siding, look for one that is easy to maintain, needing no more than regular inspection and cleaning to stay in top shape. This will not only be convenient for you but will also let you save on costs down the line because of the low maintenance requirements. What else can you remodel? Your windows! Head on over to Part 3 of this blog series to learn more about the signs that indicate the need for a window replacement.